The terrain that we've passed has been lovely. The weather, well, it's SoCal to be sure. We've passed a lot of oil rigs and production platforms. The many crude-oil slicks may be releases or natural seeps from the bottom, but it still surprised me. We've had some lovely stretches of sailing weather but have been forced to motor against strong winds, too. Love this SoCal weather! Nukes! 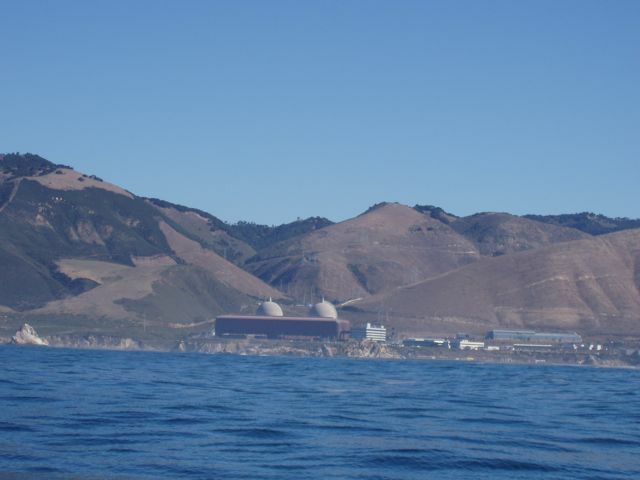 These two containment vessels are on the coast but behind some coastal mountains for protection of the population. Unfortunately, it's still on the mighty San Andreas fault! 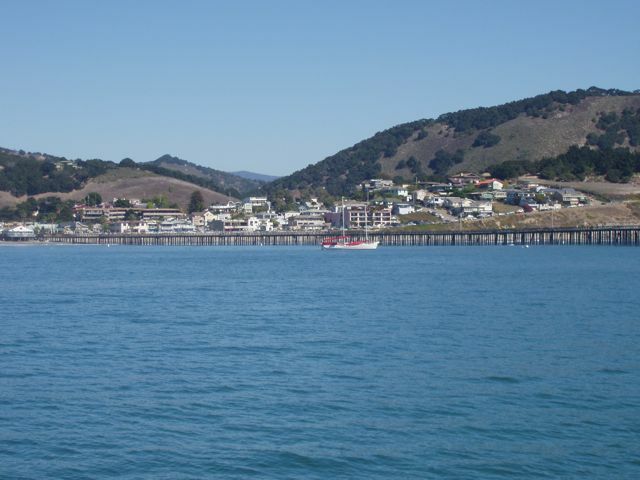 The harbor at San Luis Obispo. It's a surprisingly small town and surprisingly protected from north winds. We stayed in SLO only long enough to rest after an all-night sail. 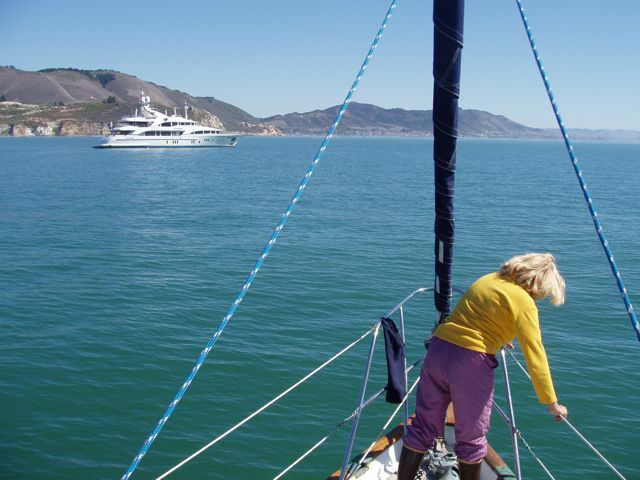 After a few hours of rest, Conni pulled the anchor and we headed offshore for another all-night sail to Santa Barbara. 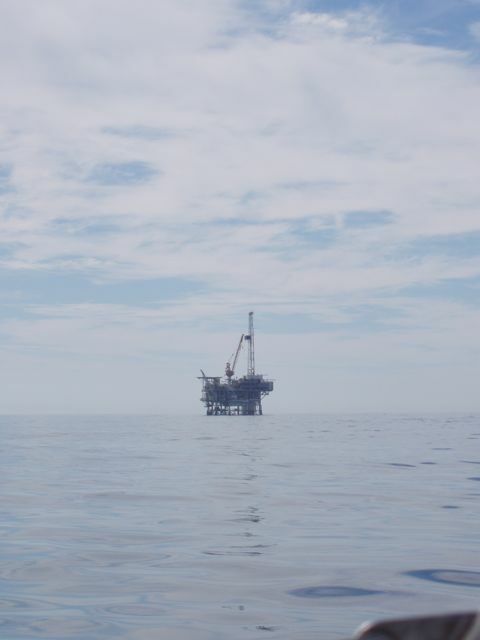 One of the many oil rigs on our way to Santa Barbara. This one has a drill rig atop it. There were a lot of oil slicks in the water near them, but I imagine that the rigs are there because of those natural seeps. It reminds me of that famous story of the bankrobber: "Why do you rob banks?" "Because that's where the money is!" 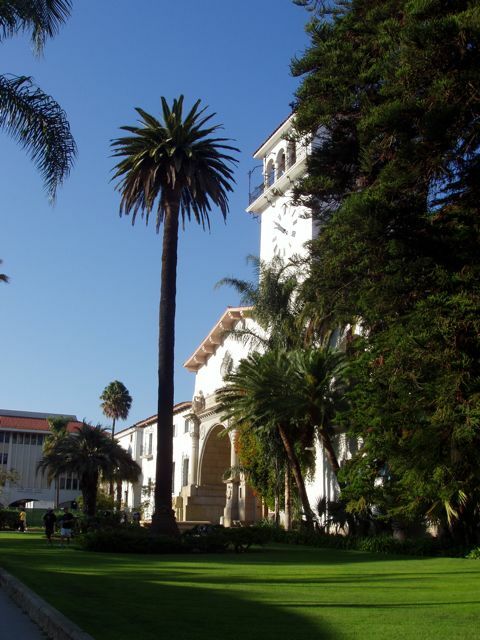 The Santa Barbara County Courthouse hosts a beautiful Spanish architecture. This staircase was covered in beautiful and complex tile. 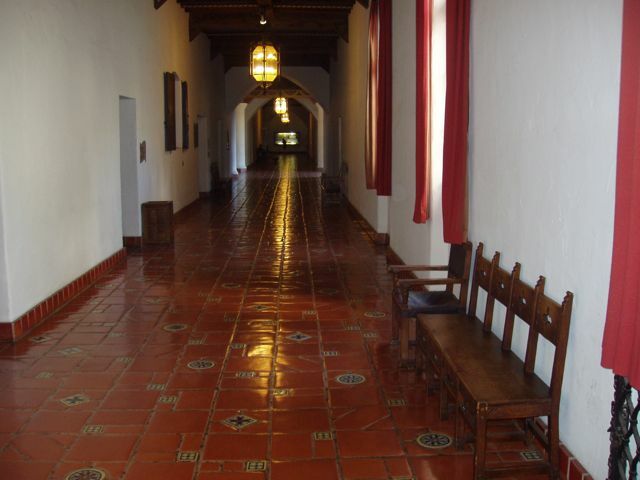 A corridor in the courthouse: polished tile and handmade accoutrements. 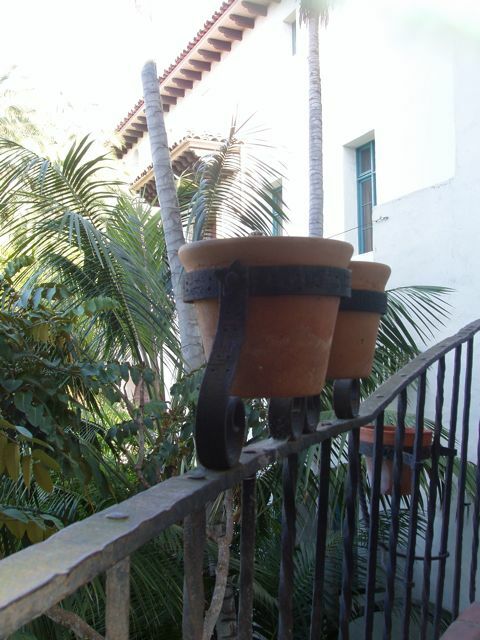 This is REAL wrought iron! Note the thickness of the rail itself and the hand-hammered work. 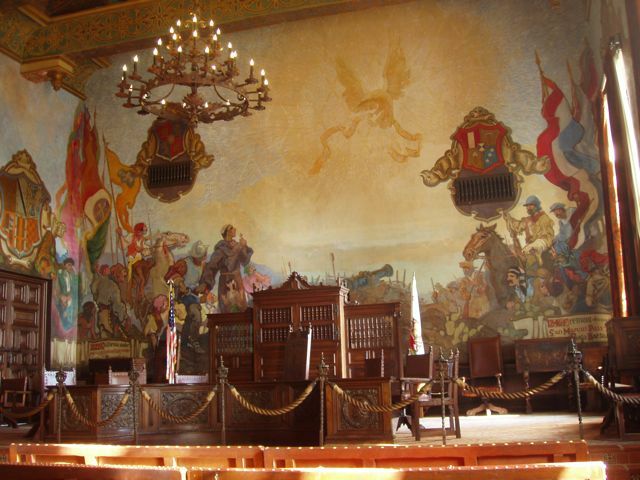 The Santa Barbara city council sits in this beautifully decorated old room. All the walls are covered in gorgeous murals depicting various landmark events in Santa Barbara's history. A view eastward from the top of the courthouse tower. The green below was the setting for a wedding. 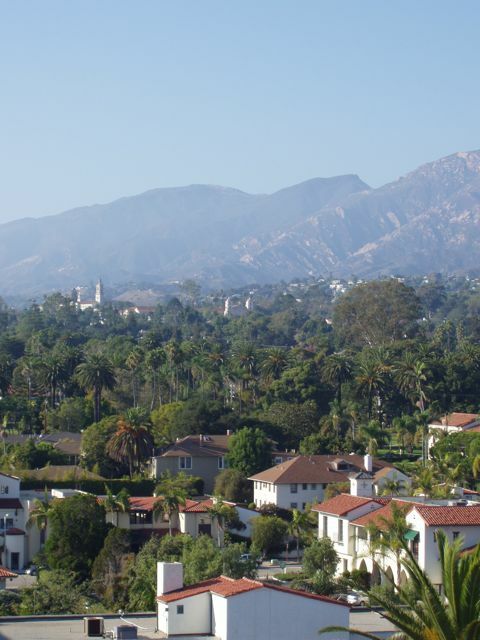 The original Santa Barbara mission is the small double tower in mid-picture. 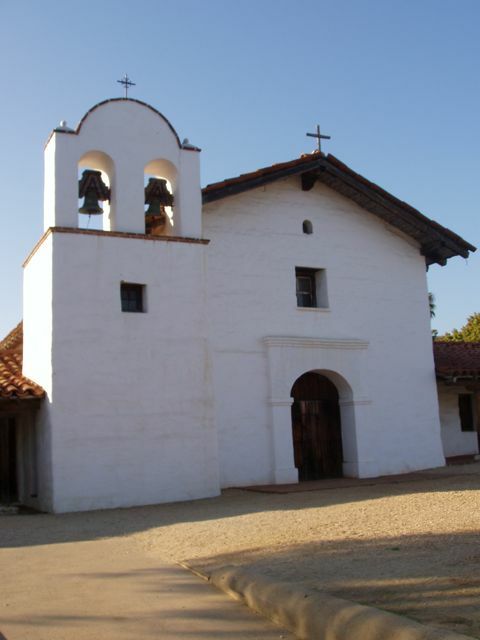 Established on the Feast of Saint Barbara, December 4, 1786, the Santa Barbara Mission was the 10th (of twenty-one total) California Missions founded by the Spanish Franciscans during the 1700's. It is an active church and is known as the "Queen of the Missions" because of its great beauty. Friar Junípero Serra (November 24, 1713 – August 28, 1784) was a Majorcan Franciscan friar who founded the mission chain in Alta California of the Las Californias Province in New Spain. Lovely Conni photographs the original jailhouse: the white building. 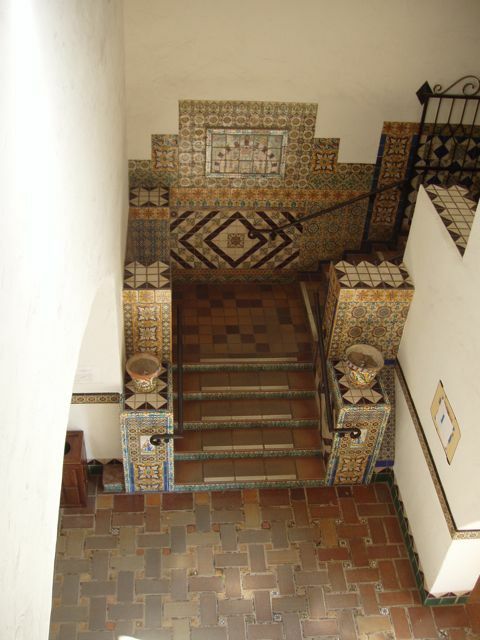 The entrance of the Santa Barbara Courthouse building. 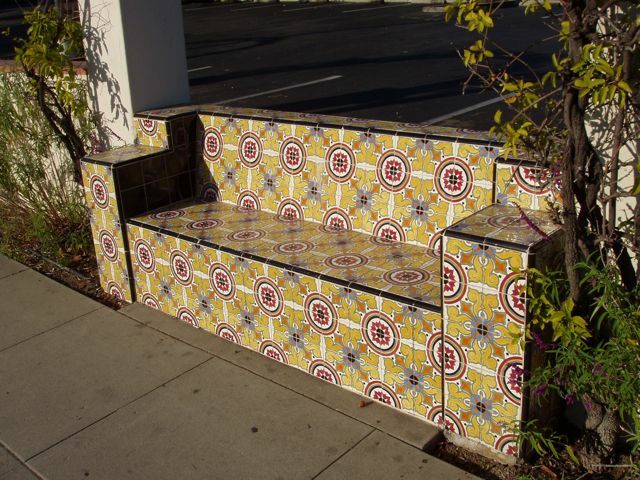 More California mentality: a beautifully tiled bench at a bus stop. 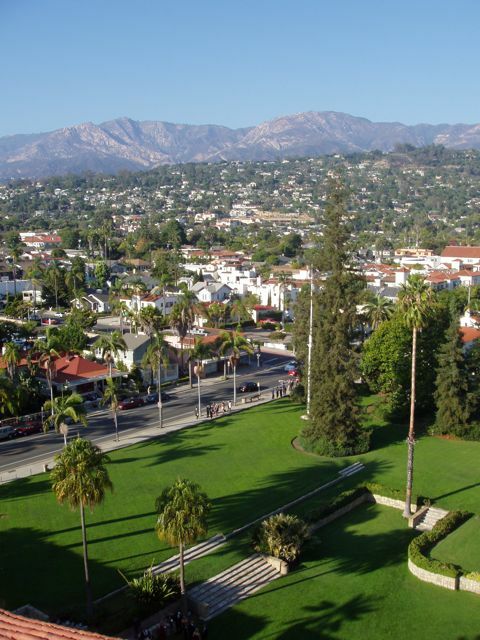 In early Santa Barbara, the King of Spain first had built an army fort, of course. 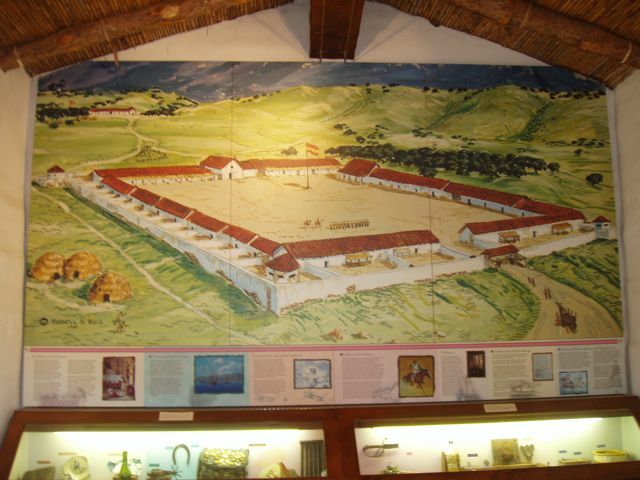 This is El Presidio Real de Santa Barbara (Royal Presidio of Santa Barbara) , and much of it still remains. The drawing is the result of extensive archeology. Note the church building on the far inside wall. It's important to note that Juan Rodriguez Cabrillo sailed around the Horn and landed in San Diego in 1542. Only 50 years after Columbus "discovered" the New World, the intrepid Spanish explorers were on the move, colonizing most of Central and South America. Admittedly poor at governance, and with an unforgivable need to spread their intolerant religion, one must give them credit for being courageous seafarers. Built in 1782, it protected the second military district in California. This is that church, looking much as it did in the 1782 when El Presidio was built. 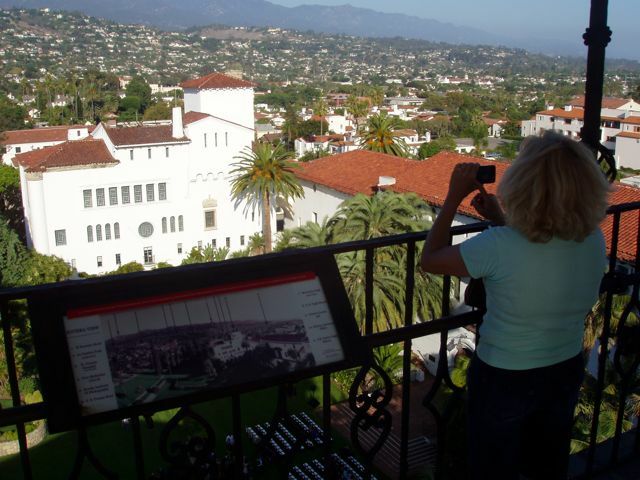 The Presidio of Santa Barbara was the last military outpost built by Spain in the New World. Saturday night in downtown Santa Barbara. 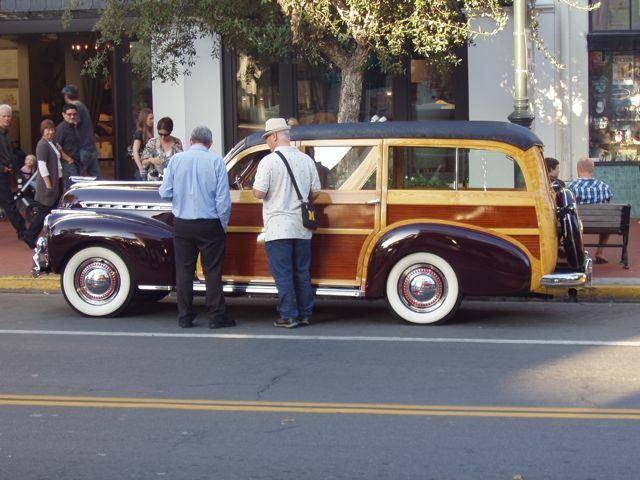 An original "Woodie" catches the eyes of a few locals as well as this sailing visitor.